The HOUSE OF MENDI shop is down for update. 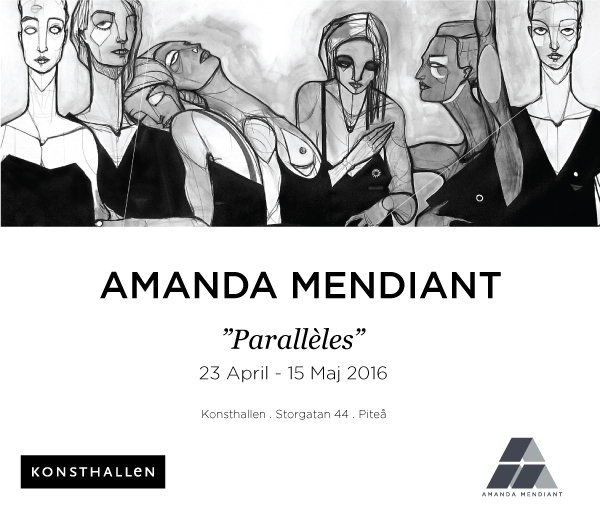 Meanwhile, you can email orders at amanda@mendiant.com. WELCOME BACK AGAIN SOON! I am currently showing paintings. Twenty pieces and almost a year’s work. At Piteå KONSTHALL. Storgatan 44. April 23rd-May 15th 2016. You are more than welcome if you happen to be in the neighbourhood… Check at Piteå Konsthall for opening hours. “The aMUSEd Project” was born during winter 2015. I decided to let women choose to be portrayed by me instead of me choosing models. As previous projects, it was also based upon the idea of setting my own physical and material boundaries: One month. Canvases in one only size, 25×25 cm and painting strictly in black & white. I called out for faces on social medias and received so many photos. Simple mobile pics, no make up, all different. All revealing. Below Muses #3, #8, #10, #15, #18, #23, #24, #30 and gathered all great ladies who had the curiosity & courage to trust me. Thank you! The mural painting “Northern Meetings” is a commissioned work for Nolia/Piteå. Sweden for their workshop and conference facilities. The theme was “meetings” so I created, based on the rounded wall, the geographic location and the theme, an organic painting of two characters where Hand and Eye contact are in focus. Which is what meetings are about. The picture’s lines and shades of green, grey and blue refer to Piteå’s northern landscape and it’s archipelago. Painted lines that could be, at first sight a map or roads and paths as well as life lines evolving, growing, tagging along parallel and crossing each other, or not at some point. Two months of sweat & tears cut down to 4 minutes. Over and Out people! Music: “ÁHPI. wide as oceans”. Courtesy of Sofia Jannok. “The ICE EMPRESS” for ICEHOTEL / Jukkasjärvi. By Amanda Mendiant. from Amanda Mendiant/HOUSE OF MENDI on Vimeo. And She’s out! THE ICE EMPRESS for ICEHOTEL. As each ice block that is harvested from Torne River measures two meters long and one meter thick, the paintings were made that precise same size. Two ice blocks of pure, crystal clear water affected by Day & Night LIGHT, theme for 2015. The Torne River, source of the building material that will melt back to the River once the season is over, is pouring through her hands and through both canvases. An ice crown reminding of the entrance of the hotel and elements such as the polar bear, the wild goose, the snowballs, as seen in earlier Art Suites. The ”studs” from an Icebar, the iceblocks, the collar and the earring, all various elements from previous designs of ICEHOTEL that has been different each time for the past 25 years. On the Day Light side, painted in shades of intense blue, white and grey you can see the snowflakes, frost, and the particular illuminating, almost blinding, light. On the Night side, the darkness, the nearly black ice blocks and the magical nature phenomenon, Aurora Borealis and it’s breathtaking colors. Two sides, one Face, The ICE, The Snow, the surroundings and the Northern LIGHT’s impact on them all. The painting was created between October 7th and December 3rd. 2014. 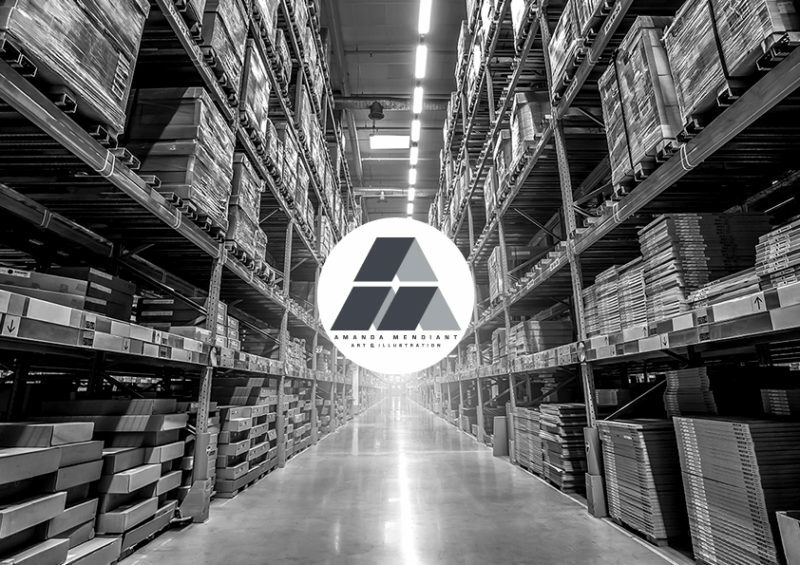 Material used are acrylics on cotton canvas, mounted on high quality frames of certified timber according to FSC and Rainforest Alliance qualification for responsible wood agriculture. All paintings and frames are assembled inhouse by Amanda Mendiant & Crew. DLA Play’s Per Morin came to visit a day in September. A couple hours talking cut down to 6 minutes… Well done Per. 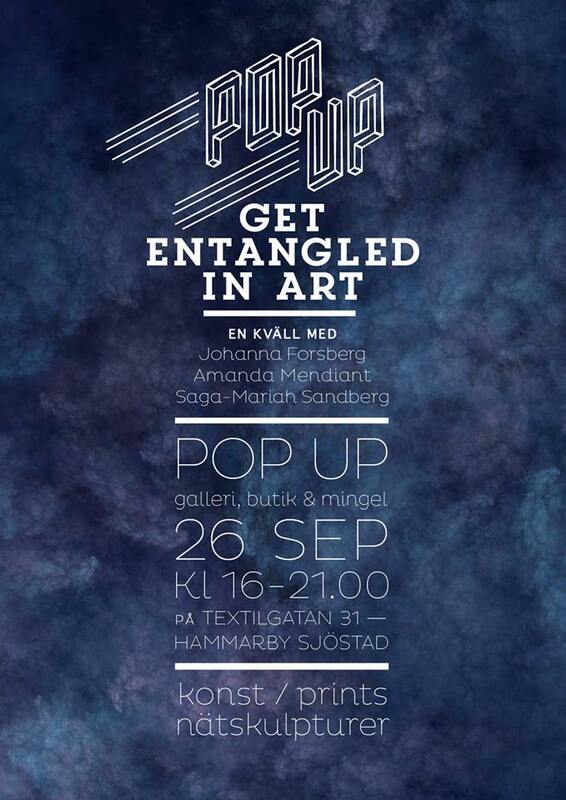 “ENTANGLED” PopUp Shop & Gallery- STOCKHOLM. On Friday 26th September, in the company of two lovely ladies, Saga-Mariah Sandberg & Johanna Forsberg, I will be having a spontaneous and one night show! Friday 26th Sept. 4 pm- 9 pm. “The Repurpose Project” June 1st-30th 2014.